Do Case Studies have a Shelf Life? Description of "Do Case Studies have a Shelf Life?" This book titled Do Case Studies Have a Shelf Life is extremely thought provoking to say the least. The very tenet on which this book is based is innovative and can incite look of debates and deliberations. It is better for anyone to consider this book as an accompaniment to my previously published book on case studies titled How to Write and Teach Case Studies Effectively? as that can offer a more holistic idea not just about case studies but also regarding the basic idea behind the making of this book. Dr. Kisholoy Roy is a Ph.D. in Management from IIT (Indian School of Mines), Dhanbad, one of the premier education brands in India. He is an Accredited Management Teacher certified by All India Management Association (AIMA), New Delhi. Roy did his Masters in Business Administration (MBA) in Marketing from Visva-Bharati University, Santiniketan, one of the central universities in India. Dr. Roy has authored several publications that include case studies, articles, research papers and books. He has been considered a subject matter expert in the domains of brand communication, retail marketing and sales. 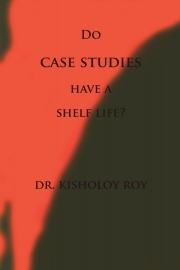 Apart from this book Dr. Kisholoy Roy has authored titles themed on case studies like How to Write and Teach Case Studies Effectively? and also Case Studies for Marketing Students; both have been phenomenal sellers in the online marketplace like amazon, kobo, lulu, flipkart, kindle, createspace and pothi. Reviews of "Do Case Studies have a Shelf Life?" This book authored by Dr Roy is a differentiated offering dealing with the subject of management case studies. The content is highly relevant and is a great eye opener for all stakeholders involved in case teaching and learning. Highly recommended for anyone who is sincere to understand the art and science of developing cases and disseminating case education.